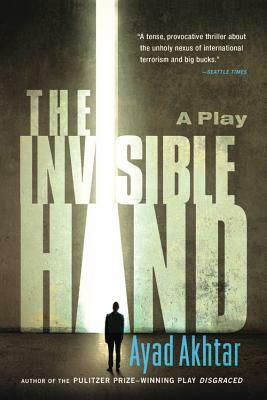 The Invisible Hand (Paperback) | The Drama Book Shop, Inc.
A chilling examination of how far we will go to survive and the consequences of the choices we make. In remote Pakistan, Nick Bright awaits his fate. A successful financial trader, Nick is kidnapped by an Islamic militant group, but with no one negotiating his release, he agrees to an unusual plan. He will earn his own ransom by helping his captors manipulate and master the world commodities and currency markets. "[A] tense, provocative thriller about the unholy nexus of international terrorism and big bucks...." (Seattle Times). "Ahktar again turns hypersensitive subjects into thought-provoking and thoughtful drama" (Newsday). "The prime theme is pulsing and alive: when human lives become just one more commodity to be traded, blood eventually flows in the streets" (Financial Times). "Whip-smart and twisty" (Time Out New York), "The Invisible Hand offers genuine insight into the future of the West" (Village Voice). Ayad Akhtar is a screenwriter, playwright, actor, and novelist. He is the author of a novel, American Dervish, and was nominated for a 2006 Independent Spirit Award for best screenplay for the film The War Within. His plays include Disgraced, produced at New York's Lincoln Center Theater in 2012 and on Broadway in 2014 and recipient of the 2013 Pulitzer Prize for Drama, and The Who & The What, produced at Lincoln Center Theater in 2014. He lives in New York City.